There are certain rules about motorbikes handed down from the Old Testament. Sport bikes shall be fast, light and uncomfortable; touring bikes shall be comfortable, carry the kitchen sink, but be ponderous and heavy; trail bikes shall be agile but slow, and so it goes. There are a few mavericks, which challenge these rules, like Yamaha's TDM and BMW's GS range, but theyve never made it beyond being niche market players. What a surprise then that that most focused of all sports bike manufacturers, Ducati, should come up with something so revolutionary, yet so utterly simple, as the Multistrada. It stands the rule book on its head. Like all the best ideas it makes you wonder why no one thought of it before. It's a blinder! Take a light, simple, powerful engine, add in top quality suspension, brakes and tyres and attach them all to a classic trellis frame. Unlike every other Ducati, with your feet in your armpits, your stomach splayed on the tank, and your chin on the headstock, the Multistrada simply changes the shape of the bike, sits you upright, lets you legs unwind, and places your hands at a natural position. The clever nose fairing which partly turns with the bars gives decent weather protection and gives you a steering lock on a Ducati which allows you to do U-turns without ending up on your back in the road. The net result is a bike which goes like stink, handles fantastically, yet which you can ride all day and not need a chiropractor at the end of it. What a revelation! Is this the future of biking? Having just spent a couple of sunny hours blatting around the coastline of East Lothian on this new Duke, I believe that this little bike will have a huge impact on sports bike design in the coming years. Think about it ... what real novelty have you seen in sports bike design in recent years? Sure, they all get a tad lighter and a smidgen faster every year, but they all look so similar these days that it is hard to tell one from another. Sport bike design has come to a dead end, with nowhere else to go. Add to this the fact that all those "born again" bikers who took up biking in their 30's, perhaps a decade ago, are all getting a bit older and stiffer than they used to be. Not perhaps ready to can the R1 in favour of a lardy old tour bus, but how many of these very extreme bikes stay in the garage because they are just too challenging to ride for any serious distance. Come on, be honest, your mates aren't listening ... would you ride more often, and further afield, if you did not come home with searing backache and reflux indigestion? As a bike, the Multistrada is far from perfect. The mirrors are a joke, the seat is rock hard, the engine is snatchy at low revs, the throttle is like an on/off switch in town. Some of these faults can be cured by dipping into the surprisingly comprehensive accessories catalogue, some are just like that 'cos it's a Ducati. It's the way they are. Deal with it. 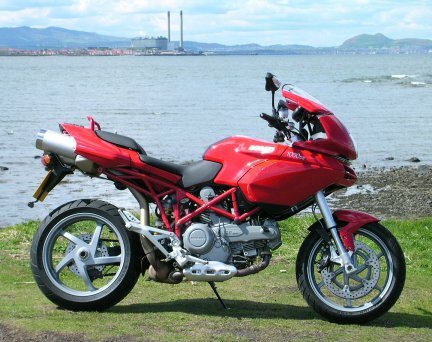 As a concept though, the Multistrada is fantastic. Our continental brothers have for years appreciated the delights of big trailies, with their all-day comfort and easy rideability, but they have never really caught on big style in sport bike obsessed UK. The Multistrada bridges that gap to perfection and in doing so invents a whole new market segment. Don't assume (as I did) that the Multistrada is just Ducati's attempt at another big trailie, it most certainly is not. It is a genuine sports bike, but with the comfort of a big trailie, the luggage options of a tourer, and the nimbleness of an enduro. It breaks the rules. I am going to make a prediction here. The Multistrada will deservedly be a best seller for Ducati, but it is such a clever idea I expect that every single one of the other big manufacturers will copy the idea, and as is always the case, someone will probably come up with an even better bike as a result. Somewhere, right now, in a darkened laboratory tucked away in a hidden corner of Japan, a Fireblade is being forcibly mated with a Transalp. Sounds ridiculous, but the result will be sensational, and you should thank Pierre Terblanche and the boys at Ducati for having the balls to do it first.